All my life, I've heard nothing good about brussels sprouts. Nasty, mushy, smelly, disgusting...I'm sure many of you have heard similar things. In fact, I've never met a person who actually likes them, or has even tried them. So as you can imagine, I was a little hesitant to try this recipe. But who can resist anything with the word "garlicky" in front of it? Oh. My. God. These were absolutely amazing. Brussels sprouts are one of my new favorite vegetables...when prepared this way, at least. Sauteed in olive oil with LOTS of garlic, a little brown sugar, and salt and pepper, there was nothing even slightly disgusting about this simple dish. My first thought when eating it was, "This tastes like little sweet and salty cabbages." And most people like cabbage, right? There's a step after sauteeing everything where you add water and simmer until it's mostly evaporated, but I don't really see the need for that step. Right before serving, you add a little cider vinegar that adds extra sweetness and tanginess. You're left with an appetizing, bright green, nutty, sweet, salty vegetable dish that makes you want to go back for seconds. Make again? DEFINITELY. 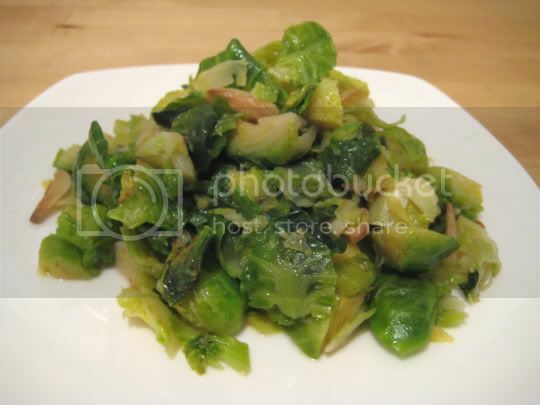 I would HIGHLY recommend this recipe for those who are brussels sprouts phobic.